A prominent town during the colonial era, Thalassery in Northern Kerala is now a pale shadow of its glorious past. Situated alongside the Arabian Sea, Thalassery or Tellicherry as it was earlier known, was an important trading post in Malabar during the British rule. Roads and bungalows are still named after many popular Europeans, and that gives a glimpse of their influence on this coastal town. Thalassery was also a major spice trading centre for ages and a stroll through its streets will give a waft of the spices and its ever popular delicious biriyani. After Vasco da Gama established trade relations in the Malabar, the Dutch and French too followed soon. In 1720s, the French East India Company had military establishments here apart from trading factories. They moved to Mahe, south of Thalassery, when the British made this trading centre their stronghold. Thalassery is where many popular things first took place in India. India’s obsessive sport, cricket, was first played in Thalassery in 1805 when the first Duke of Wellington, Lord Arthur Wellesley introduced the sport and made teams out of butlers and dhobis. Thalassery is home to India’s first cricket club formed in 1850 and is presently known as Town Cricket Club. Influenced by the British, the first cakes in the country were baked here in 1880. Mambally’s is claimed to be the first bakery in the country when they started baking cakes and biscuits for the Englishmen who wanted baked food. Indian circus also has its origins here. With influences from the Kalari exercises, Keeleri Kunhikannan who brought many reforms to circus, was the one behind the training of first set of acrobatics in 1890. He was requested by Vishnupant Chatre (he is beleived to have started the Indian circus) to train artists. Thalassery is also where Kalaripayattu had its rebirth after independence. It is also one of the first cities in Kerala where allopathic medicines were introduced. Rajyasamacharam, the first newspaper in Kerala was printed here by Hermann Gundert. The first communist party and the first naxalite movement in Kerala were in Thalassery. Andalur kaav (kaavs are sacred groves), is where I began my journey through Thalassery. Believed to have had Buddhist origins, this old temple is known for its popular festival and theyyam that takes place in the month of February. Dedicated to Rama, there are other shrines too apart from a nice stepped pond. Sree Rama Temple at Thiruvangad, close to the town is one of the largest and oldest Rama temples in Kerala. The mural paintings and the hanging bronze lamps here are a major attraction. 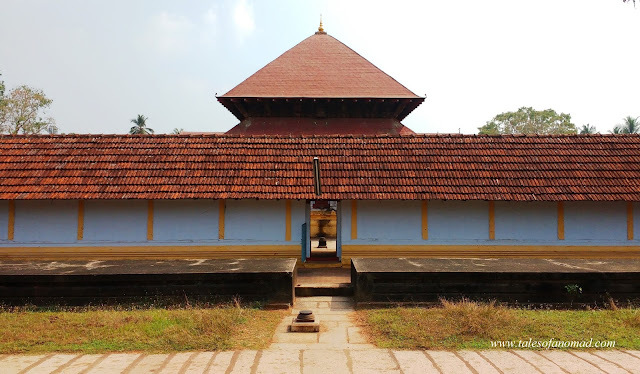 Kadirur Suryanarayana temple is the other major temple in Thalassery. Near Thiruvangad temple is CVN Kalari, started in 1921 by C V Narayana Nair, an ideal place to watch students gracefully undergo kalaripayattu exercises. Early in the morning, the semi-open room with an image of goddess and an array of armour is dimly lit, while the students with oiled bodies undergo their daily exercises and performances. From temples I headed to colonial Tellicherry. The 17th century fort built by the British was used as a trading station and most of the spice trade, Tellicherry pepper in particular, was controlled from here. The fort is also believed to have an underground passage to a large room. It presently has a well maintained garden and a lighthouse, the second oldest in India. The ramparts of Thalassery fort offer panoramic views of the Arabian Sea, the Holy Rosary church and Anglican church. A short distance away from the fort lies Overbury’s folly, presently a sea side park named after E.N.Overbury, who worked as a local judge here in late 19th century. The folly also has a watch tower and is an ideal place to enjoy beautiful sunsets. Thalassery pier lies south of the fort and a short walk through the fish market leads to it. Stretching into the sea, the pier locally referred as kadalpalam, was built by the British in early 20th century when Thalassery became a busy trading port. It is presently in a deteriorated state and is purely kept as tourist attraction. Located in Illikunnu, atop a small hill, Gundert Bungalow is now a part of NTTF, a prominent college. This colonial house with large doors was the home of Hermann Gundert in mid 19th century. The German scholar and missionary was also a linguist and compiled the first English- Malayalam dictionary apart from significant contributions in translating the Bible to Malayalam. Wellesley’s Bungalow (named after Arthur Wellesley) is another colonial house which is now converted into the sub- collector’s home. Edward Brennan, the English philanthropist is another prominent personality who lived in Thalassery and has a college named after him. I stood outside contemplating whether to enter the premises of the 500 year old Odathil palli, when the guy at the adjoining shop assured that I can walk in. Located in the centre of Thalassery town, the mosque is unique in its architectural style. Constructed in typical Kerala temple architecture, the mosque is devoid of the ubiquitous domes. While the crown on top is made of gold, the roofs are covered with copper sheets and the interiors have gorgeous artworks. Though it is claimed to have been built by the Keyee family (a prominent Muslim family in Thalassery who were spice traders and commission agents to the British), there are also sources which say that it was built by a rich Arab timber merchant. Non- Muslims aren’t allowed inside Odathil palli. Running through colonial Thalassery and its streets, I was soon at the door step of Paris restaurant on Logan’s road, Thalassery’s seventy year old popular restaurant known for its biriyani. The aroma and the traditional way of preparation makes Thalassery biriyani here a renowned one. As the old Hindi songs played feebly in the background, I relished the biriyani and washed it down with a sulaimani. Rara Avis is another hotel which serves delicious Thalassery biriyani. Thalassery is also well known for its mussels (locally called Kallumakkayi/ kadukka) which are available throughout the year except during monsoons. Ari kadukka (stuffed mussels), erachi pathiri (stuffed meat), unnakaya (fried plantain), kinnathappam (a sweet cake) and kozhikaal (fried tapioca) are the must try local delicacies which are available at bakeries and tea- stalls. Jayabharathi is a well recommended bakery in town. The renowned Mambally’s bakery known for its biscuits and cakes now has a small outlet in a mall near the fort. They were the first to make plum cakes in India and they are popular even today. I had a bite of their delicious cake before heading out of Thalassery town. I headed north towards Kannur, and en-route a few kilometers away, a short detour led to one of the best beaches I have been to- Muzhappilangad. 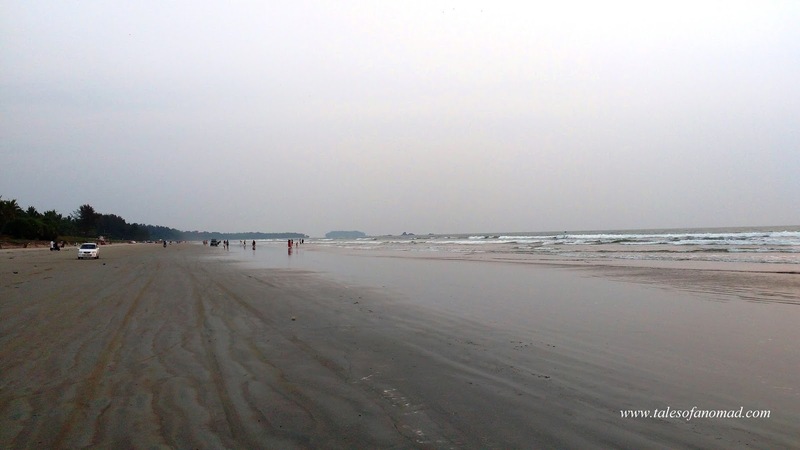 A narrow road through coconut groves lead to the expansive Muzhappilangad beach. Stretching over 4 Kms, this drive in beach is considered one of the best in Asia. Bordered with rocks, it is undoubtedly the best place in Thalassery to enjoy the evening as the sun goes down the horizon. Numerous birds can also be spotted frolicking the beach in the mornings and evenings. Dharmadom island, an uninhabited island is a few meters away from the beach and is accessible during low tide. The ride on the beach as the sun set was absolutely a blissful experience and a memorable way to end my Thalassery sojourn. Mahe, a French colonial town, 9 Kms south of Thalassery is also worth a visit. Thalassery has always been known for its 3 Cs- Cricket, Cakes and Circus. However, for me Thalassery would always be the colonial town which serves delicious biriyani and mussels. Thalassery to Kannur- 22 Kms. 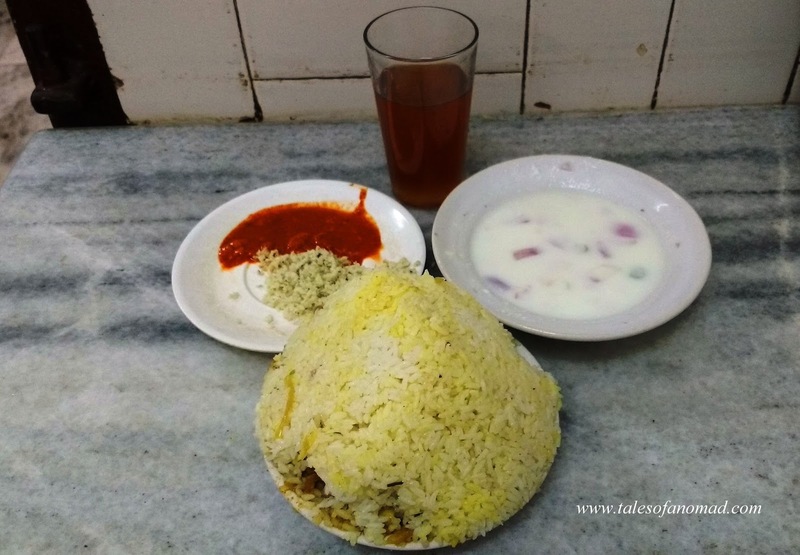 Explore biriyani and other local delicacies which are easily available across the town. Most of the restaurants and shops are on Logan road. There are numerous budget and mid range hotels in Thalassery. Paris residency is well recommended. I stayed in Kannur during my visit to Thalassery. Glad you liked it, Ani. Wow! you have covered the palce very well. 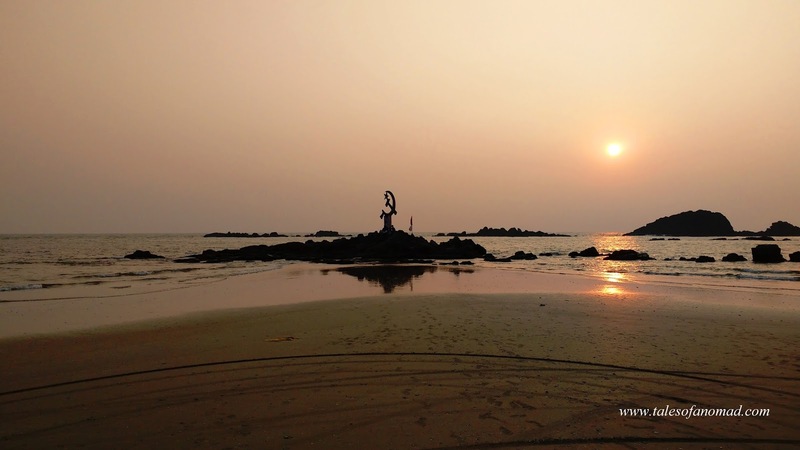 Those images stand out, and so does the curated contents of your travelogue on Thalassery. Thnaks for taking me there! Thalassery so near yet not visited. I will definitely visit this place next time I'm in my home town. I have been there and your pictures refreshed the pleasant memories of scenic locations!It indeed is a nice travel-post! Thalassery is home to India’s first cricket club formed in 1850 and is presently known as Town Cricket Club. Influenced by the British, the first cakes in the country were baked here in 1880. Mambally’s is claimed to be the first bakery in the country when they started baking cakes and biscuits for the Englishmen who wanted baked food. Indian circus also has its origins here.Beautiful coverage of a historical place with grand pictures ! I never been there but would like to go to visit this historical town. Oh wow! So many firsts? What an enlightening post. Thalassery looks lovely too. You have explored tourism prospects of this small town. Even the local people are not aware of the greatness of their town. Tourism department of Kerala must read this note on a neglected place. Done a great job. Thank you. I am from Chennai but studied in NTTF Thalaserry for a year. I got so much attached to this place, I go there every time I visit India, even tough I don't know anyone there now. Thanks for this article, I did not know these details. Glad to know that you liked it. Hope this would spur you to visit the place once again.